Open Monday-Saturday 10:00 a.m. to 9:00 p.m.
Garfield's Corn Maze is a 9-acre adventure to get yourself lost in. 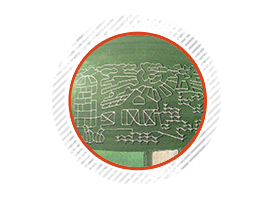 Ten stations are hidden throughout the maze. Find the ten stations and the hidden object and get a candy bar or can of pop at the end. For an even greater challenge, try the maze at night by flashlight! Kooima Corn and Bleyenberg Sweet Corn is a summer tradition for us. 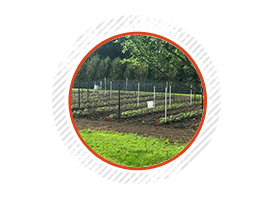 We also have 2 large gardens and a greenhouse to grow an assortment of vegetables all summer long. We specialize in salsa items sold by the 5 gallon bucket! Pumpkins galore and more! Check out our retail Store for Farm to you items. 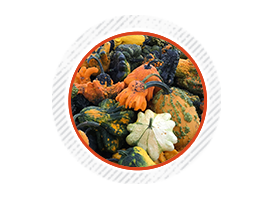 We offer pumpkins, gourds, broom corn, Indian corn, corn stalks, and straw bales. We also have Fresh dug potatoes, onions, peppers, and tomatoes in the fall.